Je Tsongkhapa Lobsang Drakpa (1357-1419) was one of the greatest scholar-practitioners in the history of Tibetan Buddhism and the founder of the Gelug tradition. While still a young man, Tsongkhapa distinguished himself through intense study, a sharp intellect and meditative accomplishment. In the last three decades of his life, Tsongkhapa dedicated himself to practice, teaching, writing and establishing monasteries. Respected by all four schools of Tibetan Buddhism, Lama Tsongkhapa’s deeds contributed tremendously to the revitalization of Buddhism in Tibet. Join us as Geshe Ngawang Dakpa discusses the major points of Lama Tsongkhapa's life! 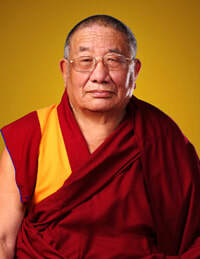 Geshe Ngawang Dakpa served as a resident teacher at Tse Chen Ling. He was born in Nangchu, northeast of Lhasa, Tibet. He became a monk at the age of ten. At the monastery he studied both Dharma and secular subjects extensively before entering Sera Je Monastery eleven years later. He fled Tibet in 1959. Upon his arrival in India, Geshe-la not only continued his monastic studies, but also spent three years at the Sanskrit University in Benares, earning an MA with honors. Invited by the Queen of Sikkim, he taught at the University of Sikkim for nearly 20 years before returning to Sera monastery in South India and obtaining his Geshe degree.